We arrived at Texas Children’s Hospital. “Another kids’ hospital,” I thought. Austin and Kira, accompanied by Kira’s mother, Sandy Roth, went to admitting while Val, Allie and I found the fourth-floor waiting room. A new hospital for us, but a very familiar setting, my eyes immediately began scanning the area for a comfortable campsite with ample outlets, while the ladies purchased sandwiches that tasted as though they were made from the same material as their wrapping. We finished eating and settled into our electronics. Sandy eventually came for us and, aside from dinner, we all sat in Kira’s room into the evening, uneventfully waiting, talking, joking, eating peanut M&M’s, watching baseball and planning a baby’s funeral. Well into the night, nurses checked on Kira and Teagan while Val, Allie and I sat downstairs, waiting to hear whether Teagan was imminent. A few Starbucks after midnight, it was determined Kira would not be delivering soon, so the three of us drove back to the apartment to sleep. Saturday morning was more of the same, just a different waiting room waiting for a couple of hours until Sandy came for us. Her smile showed her strength and faith. We entered the room to see Austin and Kira’s bloodshot eyes telling of their heartache, while Sandy remained strong and in control. I kissed Kira on her forehead while she held Teagan, and I then hugged Austin. “How do you do it,” he whispered through his tears. “In some ways, you’re already ahead of me,” I replied. Kira carefully handed me Teagan's body, and I sat on a stool, slowly rocking her, knowing it was unnecessary, but wanting to sing to her. James Taylor’s “Sweet Baby James” was my go-to lullaby with our three babies, and I had looked forward to singing it again to my grandkids. Valerie urged me to sing. “I can’t,” I whispered. It hurt too much to even sing it in my head, much less out loud, much less to any tune. Finally departing, I took Sandy to the airport then drove back to Dallas, while Valerie and Allison stayed behind to help Kira and Austin, and settle details for a funeral in Oklahoma. 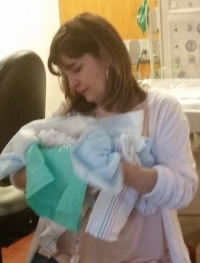 Consider the complexities with a baby passing away in Texas on Saturday, July 1st, and being buried in Oklahoma July 5th - three days to prepare, with one a Sunday and another a holiday. There was one funeral home in Houston to pick up Teagan and another in Oklahoma to receive her. A Fetal Death certificate needed to be signed Monday morning, picked up by the Houston funeral home and taken to the Vital Statistics office for the registrar to sign a Burial Transit permit for transporting a body across state lines later that day. A funeral and plot were required, and where to find a florist on a holiday who can create a display for such a tiny casket? Things fell into place. Everything. Docs were signed without delay and they proceeded north, dropping off Valerie and Allison in Dallas before continuing to the funeral home in Norman. A woman was found who created a flower arrangement for the casket. The day of the funeral was hot, but sunny and tolerable. And topping it off, Teagan would be laid to rest next to her cousin, Alyssa, the two-month-old daughter my brother and his wife lost in 2000. So, how can one be thankful for this outcome? I’m not. As I’ve said before, however, watch for thankfulness and you will find it, often in the most challenging situations. I’m thankful we could be there with and for them. It was difficult watching my dad, ninety-six years old, comforting my kids, but I’m thankful he could. Sandy Roth is a star, a hero, a daughter-lovin’ rock of support when Kira needed her. My daughter is experienced in logistics around planning a baby’s funeral and transporting a body across state lines, and she still has humor. I’m thankful for the competent, caring staff of Texas Children’s Hospital. I'm thankful that, even after seventeen years, a place was available for Teagan next to her cousin. I’m thankful for a mother’s love. Kira’s love, dedication and pain for the daughter she never met is the epitome of what you want from someone caring for your grandchild. So, now my dad has a great-grandbaby with him here on earth, and my mother has a great-grandbaby with her in heaven. And yeah, I’m a grandfather…and Still Thankful. P.S. HOW TO HELP – The brief time Kira had with Teagan was paramount to beginning the healing process. Read in Kira’s own words how you can play a part in the healing process: click here.